According to Via’s processor roadmap, dual-core Nano processors are planned to go into mass production starting June 2010. 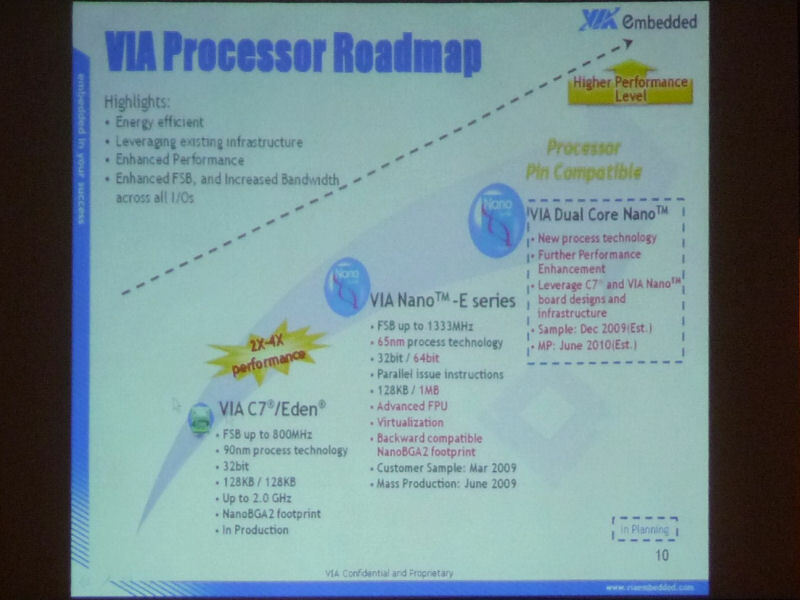 Via’s processor roadmap was presented at ET2008 in Japan the other week, which revealed the company’s plans to start mass production of dual-core Nano processors in June 2010. The upcoming processors will feature a new process technology and will likely be showing up in new products by the end of 2010. It is unclear whether these new processors will be targeting netbooks, nettops or some other market. Although a dual-core Intel Atom processor is currently available for the nettop market, neither Via nor Intel have yet released dual-core offerings for the unexpectedly popular netbook market. Intel is expected to launch Pineview, a dual-core Atom processor featuring an integrated graphics solution, sometime in the third quarter of 2009. It is yet to be seen whether this dual-core processor will have a place in the netbook market, but it seems likely that it will be only for low-cost desktops and nettops. The currently available single-core Via Nano processors are considered by some as the only viable competitor against the current reign of Intel Atom processors, however Nano processors are somewhat new to the market and products featuring Nano processors still remain rather rare. Current benchmarks indicate that Nano processors designed for nettops have a performance edge over the current single-core Intel Atom offerings, but that they also have a higher power consumption while under load. Via is said to be trying out a new strategy in which it will target emerging markets, such as those in China, Brazil, Russia and India. By offering its processors at low prices, Via could establish an early foot hold in these areas and steal market share away from Intel. AMD had announced it will not be producing processors for the netbook market, but it will instead target mini-notebooks that feature screen sizes ranging from 11-inches to 13-inches. With Dell’s recently released 12-inch Inspiron Mini 12 notebook using an Intel Atom processor though, AMD’s ambitions could still end up stepping on the toes of Intel and quite possibly Via’s too. That is really far down the road via.... I have sold a few laptops with Via chips in em. They were quite snappy and we could sell em for dirt cheap with decent margins. It would be nice to have that again Via. Above a certain size, you expect performance from a notebook. Netbooks are popular because they are so small. I think the arbitrary upper screen size limit of 10-11 inches is probably the maximum "portable" size. Mini notebooks (12-14 inches) are still smaller and lighter than power-house laptops, but you expect more performance from them too (watching Movies, playing simple games, etc...). The Atom, as evident from numerous Tom's reviews, simply doesn't compete with equally low-energy, yet far more powerful Core2 and Athlon designs. It's also ironic that the Atom is so popular in Netbooks, considering the energy consumption of the chipset undoes any energy efficiency of the processor. I have to think integrated VIA solutions running a Nano processor are more energy efficient. That's our Via! Always 3 yrs late and a dollar more in our pocket! Ha! in 2010 there sure be a quad core atom with newer architecture and more speed with DDR-3 support on the list! hahaha! Late for Via!